Brooke Horack smiles as she poses for a photograph. 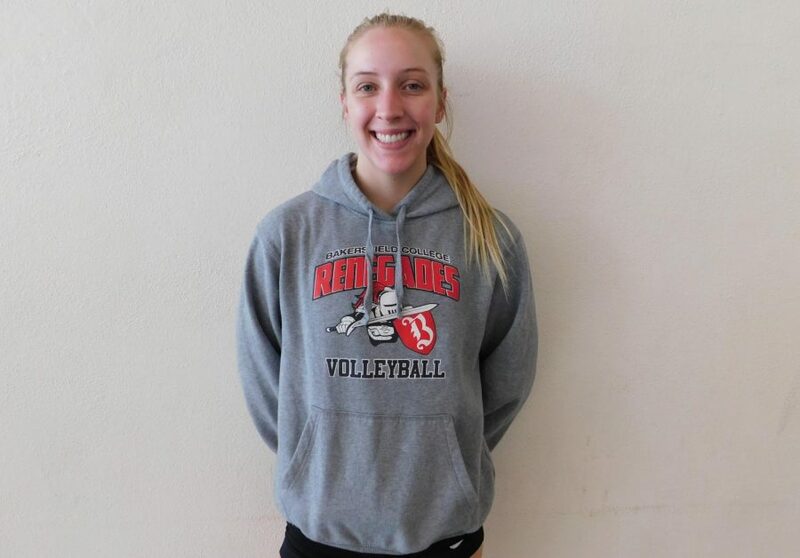 Bakersfield College volleyball coach Carl Ferreira said that Brooke Horack is ranked the most efficient middle blocker in the state. Horack has been playing volleyball since the 6th grade and has been playing since. Horack mentions that one of the challenges of playing volleyball is that it’s a mental sport. When playing or practicing, it’s important to have the right mindset. Horack stated that volleyball practice is more of them working as a team and working on the chemistry. She adds that being there for each other is important because they are like a family. Focusing on that is when, as she mentions, they play the best because they are not just playing as players, but as a unit. Horack remarks that the most challenging part of volleyball is the mental aspect of it. She comments that they workout with Zack Peters, who is the Director of Strength and Conditioning, to strengthen their muscles. Then they go to the assistant athletic trainer, Mike Medeiros, who helps them recover, which she mentions is really helpful. “The schedule is we practice every day from four o’clock to seven o’clock in the afternoon, but I’m usually here at three because I go to Mike for treatment. Wednesday and Friday are games at 6 p.m. We normally have tournaments in the beginning of the season, but those already passed,” said Horack. Horack is currently majoring in animal science. She says that she has wanted to be a veterinarian since she was very little, and she loves animals. She always seemed to want to helped animals because for her they’re like her therapy. She does want to continue playing volleyball at a four-year institution, but not professionally because she wants to focus on being a veterinarian.